Hello everyone – We are excited to launch the opening of delegate registrations for our latest logging technology conference coming to Vancouver in March 2019. Our one-day conference is packed with people from across the globe bringing you practical updates on the latest technologies set to make an impact on the British Columbia and Pacific Northwest forest industries. The advent of communications and software technologies are set to bring game-changing developments to our logging and forestry harvesting companies and logging contractors around the world, but especially in the most challenging areas of steep and remote forest terrain. 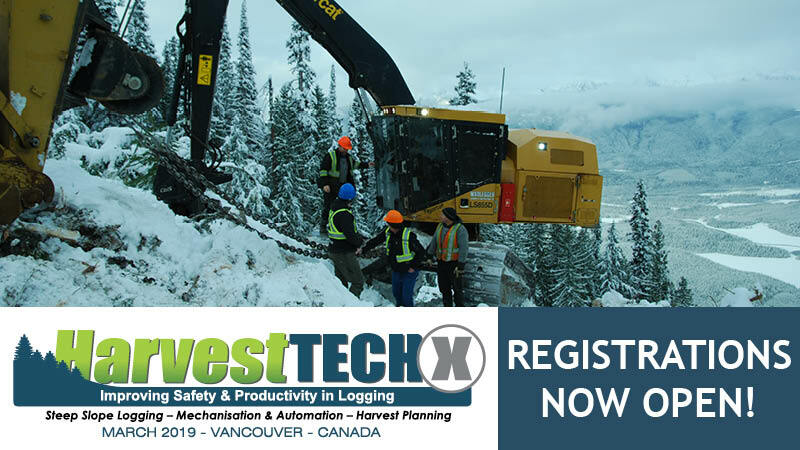 Our HarvestTECHX conference, previously known as the Steep Slope Logging Conference series that ran in 2016 and 2017 is going to be very popular with owners and managers of both logging companies and forest licences and timber companies. The event sold out in 2016, so be sure to register as soon as possible. We have very limited spaces for the in-forest workshop being organised by our event partners at BC Forest Safety Council – register today to ensure your staff can get a place for the workshop to follow our one-day conference. The team at BC Forest Safety Council will also be issuing personal invitations for some of the places on their workshop as well.